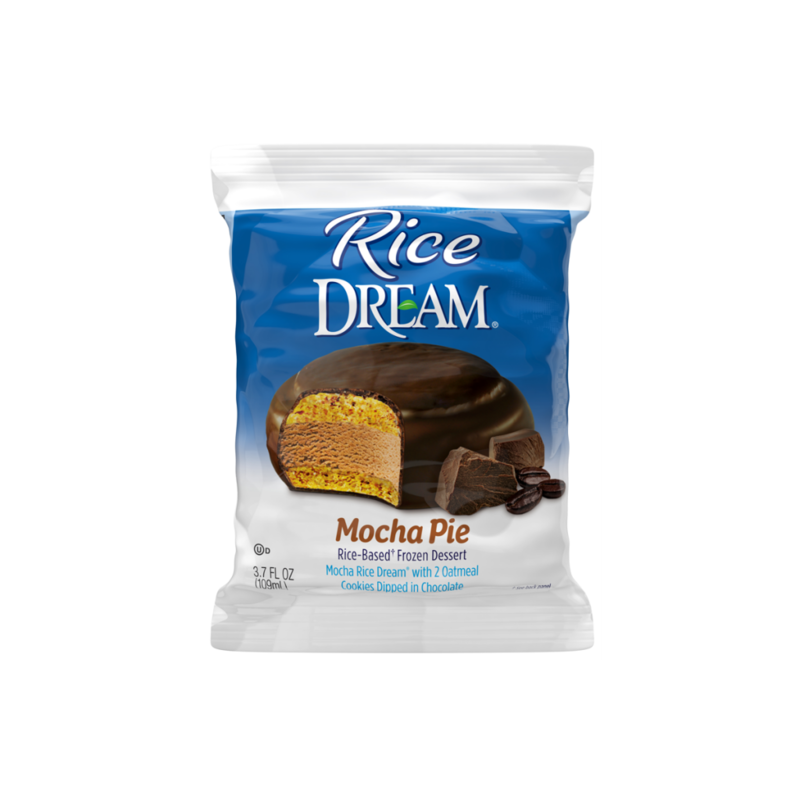 Rice DREAM® Mocha Pies prove that good things do come in smaller packages. We take two delicious oatmeal cookies, place mocha frozen dessert between and smother the whole thing in rich chocolate. Every bite is heavenly. †Not for milk allergic individuals. Filling: Filtered Water, brown rice (partially milled), expeller pressed high oleic safflower oil, natural coffee flavor with caramel color, tapioca starch, guar gum, sea salt, carob bean gum. Oatmeal Cookies: Wheat flour, rice syrup, expeller pressed safflower oil, oats, baking soda. Coating: Coconut oil, evaporated cane sugar, unsweetened chocolate†, soy lecithin, vanilla. Contains: Wheat, Coconut, Soy. †UNSWEETENED CHOCOLATE CONTAINS MILK. NOT SUITABLE FOR MILK ALLERGIC INDIVIDUALS. Manufactured in a plant that uses peanuts, eggs and tree nuts.